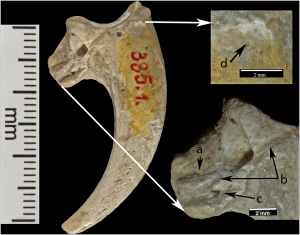 The authors of this article describe eight, mostly complete white-tailed eagle (Haliaëtus [Haliaeetus] albicilla) talons from the Krapina Neandertal site in present-day Croatia, dating to approximately 130 kyrs ago. Four talons bear multiple, edge-smoothed cut marks; eight show polishing facets and/or abrasion. Three of the largest talons have small notches at roughly the same place along the plantar surface, interrupting the proximal margin of the talon blade. These features suggest they were part of a jewelry assemblage, — the manipulations a consequence of mounting the talons in a necklace or bracelet. An associated phalanx articulates with one of the talons and has numerous cut marks, some of which are smoothed. These white-tailed eagle bones, discovered more than 100 years ago, all derive from a single level at Krapina and represent more talons than found in the entire European Mousterian period. Presence of eight talons indicates that the Krapina Neandertals acquired and curated eagle talons for some kind of symbolic purpose. Some have argued that Neandertals lacked symbolic ability or copied this behavior from modern humans. These remains clearly show that the Krapina Neandertals made jewelry well before the appearance of modern humans in Europe, extending ornament production and symbolic activity early into the European Mousterian.